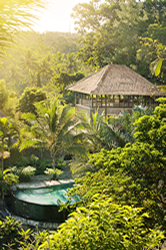 absolutely succeeded: No holiday retreat in Bali exceeds the sense of wilderness seclusion that is Villa Keliki, which occupies a rocky promontory with a sheer, 180-foot drop to a pair of rushing rivers that merge in the gorge below. The estate unrolls across a full hectare, two and a half acres of wilderness and exquisite gardens, bounded by waterfalls and streams crossed by bamboo bridges. Davids engaged the renowned Bali-based architect and designer Made Wijaya to create four fine country houses for the estate, each completely private and individual in character. The result is a masterpiece, or rather four masterpieces, celebrated by a lavish feature in Architectural Digest. The facilities are unparalleled, with two infinity-edge swimming pools, a gym, sauna and spa open to the outdoors, two baronial kitchens capable of cooking a banquet, and a wine cave carved directly into the rock, stocked with Davids’ legendary Sea Smoke Pinot Noir and Chardonnay. 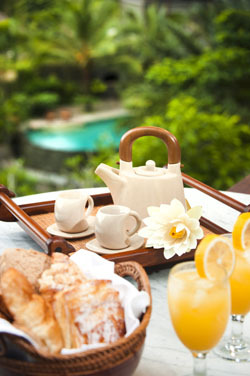 The miracle of Villa Keliki is that this pocket dominion is a ten-minute drive from the cultural treasures of Ubud, the most famous village in the tropics, where art museums and ancient temples comfortably coexist with fine dining and fabulous shopping that are the equal of any resort destination in the southern hemisphere. The only limits to the possibilities of a stay at Villa Keliki are the visitor’s imagination – and the sky.